The peracetic acid/peroxide disinfectant concentration must be below the industry standard of 3 ppm prior to initiating 1,2,4 dialysis. Peracetic acid disinfectants contain peracetic acid, hydrogen peroxide and acetic acid. Peroxide is present at a higher concentration than peracetic acid, therefore when peroxide is less than 3 ppm, peracetic acid levels will be even lower. 1. Renalin Cold Sterilant Information for Use sheet from Minntech ReSource CD, Version 1.0, 2001. 2. Product insert for Peracidin Dialyzer Reprocessing Concentrate, pg. 8, HDC Medical, Inc., Simpsonville, KY.
3. AAMI Standards and Recommended Practices, Dialysis, 2008 Edition, RD47- Reprocessing of Hemodialyzers. Association for the Advancement of Medical Instrumentation. Arlington, Virginia. 5. National News article, Nephrology News & Issues, August 2002, pg 10-11. 6. NANT Dialysis Technology – A Manual for Dialysis Technicians, 2nd Edition. (2000), page 255. National Association of Nephrology Technicians/Technologists, Dayton, OH. dialysis. Peracetic acid disinfectants contain peracetic acid, hydrogen peroxide and acetic acid. Peroxide is present at a higher concentration than peracetic acid, therefore when peroxide is less than 3 ppm, peracetic acid levels will be even lower. 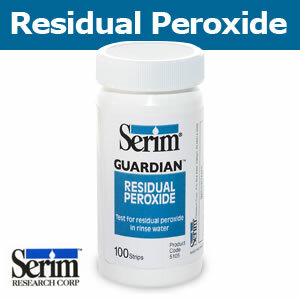 Use Serim GUARDIAN Residual Peroxide Test Strips to test rinse solution from any convenient port where the solution has passed through the dialyzer. If a peracetic acid/peroxide disinfectant was used to disinfect the water system or dialysis machines, obtain a sample of rinse solution from any convenient port in the rinse line per manufacturer's instructions. Use Serim GUARDIAN Residual Peroxide Test Strips after completing the dialyzer rinse procedure and prior to initiating dialysis. AAMI Standards state that the residual chemical disinfectant concentration be tested according to manufacturer's instructions. Serim GUARDIAN Residual Peroxide Test Strips are supplied in ready-to-use form. When placed in contact with the sample according to the directions for use, (see below) the indicator pad changes color relative to the concentration of peracetic acid/peroxide disinfectant present. Test Strip Technique Immerse indicator pad into the rinse solution for 2 seconds, then remove and shake off excess sample Dispense several drops of rinse solution onto the indicator pad. After 2 seconds, shake off excess. Store bottles of Serim GUARDIAN Residual Peroxide Test Strips at temperatures between 15°-30°C (59°- 86°F).